Ruth Lambert MBE, who has been the face of MOMA Machynlleth and chair of the Machynlleth Tabernacle Trust for nearly thirty years, has been honoured as Fellow of Aberystwyth University. 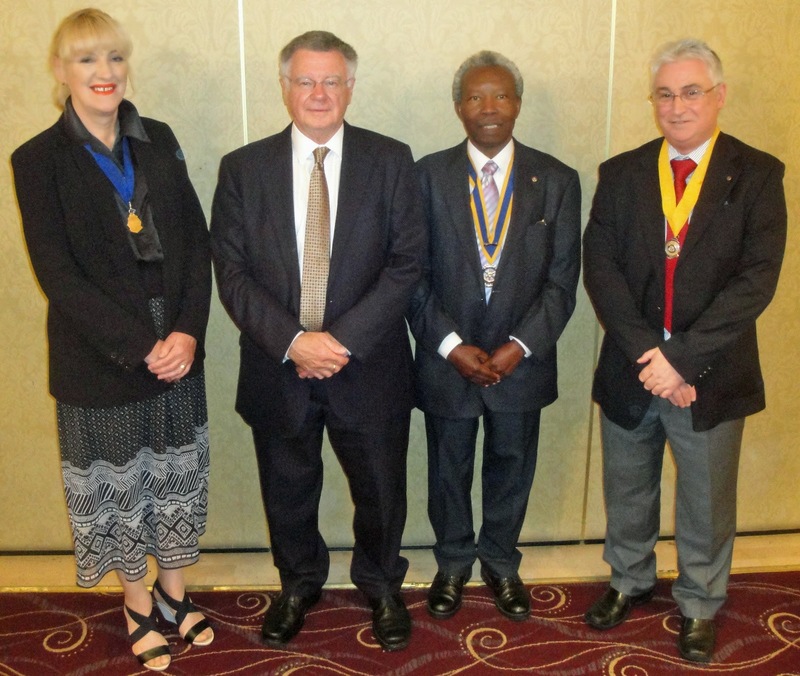 Ruth Lambert was presented as Fellow by Professor Robert Meyrick, School of Art. Pro Chancellor, Vice-Chancellor, prospective graduates and supporters. It is an honour and a privilege to present Ruth Lambert as a Fellow of Aberystwyth University. Ruth can be credited with revitalizing the mid Wales market town of Machynlleth. Through her tireless work ensuring the growth, success and sustainability of the Museum of Modern Art,Machynlleth – with its regular programme of exhibitions, performances and festivals – Ruth is to Machynlleth as Richard Booth is to Hay-on-Wye, town of books, Peter Florence to the Hay Festival, John Christie to Glyndebourne, and Leslie Evershed-Martin to the Chichester Festival Theatre. All shared a commitment to promoting and supporting the arts and cultural activities at community, national and international levels. Ruth was born and brought up at Glaspwll, near Machynlleth. She is the granddaughter of Owen Owen, the entrepreneurial son of a Montgomeryshire hill farmer, who at the age of 20 opened his own draper’s shop in Liverpool. It would become the largest department store in the north of England. By the 1950s, Owen Owen department stores were on high streets in towns and cities all round the UK – from Blackpool and Birkenhead to Ilford and Ipswich – as well as in Canada. Owen was mindful of employee’s wellbeing, gave staff half-day holidays each week, set up a trust fund for retired employees, and he was an active supporter of worthy organisations in Wales. Ruth inherited the family social conscience, philanthropic disposition and has used her talents to foster the arts in Wales. As a child during World War Two, she was privately schooled with her cousins at Plas Dinam at Llandinam. There she witnessed at first hand the Davies family philanthropy and their work in aid of a multiplicity of good causes in Wales, not least the work of Gwendoline and Margaret Davies as art collectors, patrons of the arts and supporters of literature and music-making in Wales. In 1949 Ruth accepted an Exhibition at Westfield College, University of London and graduated in History in 1952. She travelled around the world before marrying Naval Officer Richard Lambert in 1954. After bringing up a family she worked as a voluntary social worker in North Kensington from 1969 to 1976 and served as a Justice of the Peace for Inner London from 1981 to 1989. For 30 years now, Ruth has been the face of MOMA Machynlleth. The project began in 1984 when her son Andrew Lambert bought an abandoned Wesleyan Chapel, established a charitable company, the Machynlleth Tabernacle Trust, and oversaw the chapel’s renovation as a centre for the performing arts. From 1986 to 2009 and from 2012 to 2015, Ruth was Chairman of the Truststaging a full programme of concerts, events, exhibitions and organising the renowned Machynlleth Music Festival. Since 1986, MOMA Machynlleth has transformed several adjacent buildings into a series of interconnected exhibition spaces, an auditorium, recording facilities, green room, artist’s studio, music teaching and practise rooms, and spaces for lifelong learning classes. The old chapel auditorium has perfect acoustics and seats 350 people. Next month it will be home to the 30th Machynlleth Festival, a weeklong programme of chamber and choral music, jazz, poetry readings and master classes by eminent musicians who come from all over the world to sing and play. This year, for example, the Festival will feature a wind quintet from the Netherlands, a Russian violinist, Ukranian violist, French and Italian pianists, and the Budapest Café Orchestra. One of the highlights is the presentation of the Tabernacle Trust’s ‘Glyndwr Award’ for an Outstanding Contribution to the Arts in Wales. The galleries showcase Welsh art and began doing so long before our national museums seriously took up the mantle. MOMA Machynlleth exhibits works by artists from all over Wales. In August each year it organises the Tabernacle Art Competition. Over time, the Trust has built up a significant permanent collection of works by artists living or working in Wales. As one critic puts it: “Forget MOMA New York. The place to be for the next few months is MOMA Machynlleth. Here you’ll find an exhibition that will give you as much visual and intellectual pleasure as any show now on in the UK.” He was writing earlier this year of the exhibition ‘Romanticism in the Welsh Landscape’. With paintings by Richard Wilson, Turner, Graham Sutherland, John Piper and Ceri Richards, it was MOMA’s most ambitious exhibition to date. And let it be said of Ruth, every penny – every monetary gift (large or small), every loan, every bequest – has been hard won by her and her Trustees, for public sector funding was a long time forthcoming. It took five years, for example, to raise the money from private sources to convert a former grocer’s shop into state of art galleries. In my experience, Ruth leads by example and works tirelessly to further the aims of the Tabernacle Trust. She is always present to welcome guests at exhibition private views and at performances. She certainly does not shy away from rolling up her sleeves up to serve refreshments or collect glasses, usher crowds or lend a helping hand where it is needed. Husband Richard and son Andrew remain a constant support. Ruth sees herself as the ‘figurehead’ of the organisation and is first to acknowledge the voluntary effort of those who have worked so hard to make the Trust a success, not least the active and loyal group, Friends of The Tabernacle. Ruth was awarded an MBE for services to culture in the New Year’s Honours List in 2004. She has since seen MOMA Machynlleth go from strength to strength. For thirty years she has provided opportunities for artists, musicians, writers and makers from Wales and across the globe. Her contribution to Welsh culture, community engagement with the arts, and endeavours to reach ever-wider audiences is an example to us all. Pro Chancellor, it is my absolute pleasure to present Ruth Lambert to you as a Fellow of Aberystwyth University. Twelve individuals are being honoured by Aberystwyth University during the 2016 graduation ceremonies, which take place at the University’s Arts Centre from Tuesday 12 July until Friday 15 July. 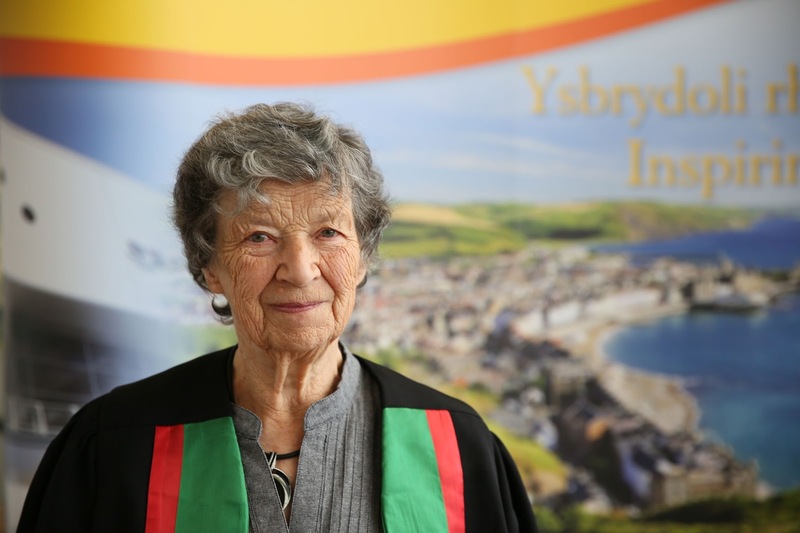 Eight Honorary Fellowships will be presented to individuals who have, or have had a connection with Aberystwyth or Wales, and who have made an outstanding contribution to their chosen field. One Honorary Doctorate degree will be presented. These are presented to individuals who have been outstandingly successful in their field, or who have a long record of renowned research and publication. Three Honorary Bachelor degrees will be presented. These are presented to individuals who are members of Aberystwyth University staff without an entry-level degree in recognition of long-service, contribution and dedication to the Institution; and members of the local community who have made a significant contribution to Aberystwyth and the area. A J S “Bill” Williams MBE (1920-2016), RAF pilot and Aberystwyth University lecturer named in 2014 as one of the Royal Society of Chemistry’s 175 Faces of Chemistry. Aled Haydn Jones, Welsh radio editor, presenter and former radio producer with BBC Radio 1, and presenter with S4C. Stefan Osgood (1994-2016), who achieved and contributed a great deal while studying at Aberystwyth, including through his involvement in sports, and as an exceptional contributor to Raising and Giving at the University.